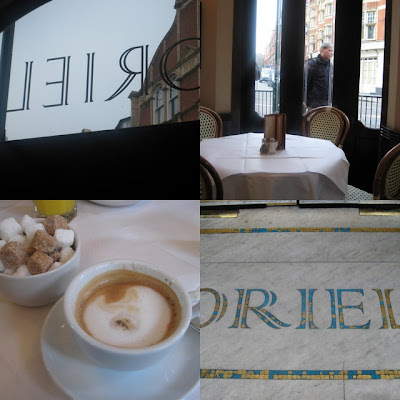 Before setting off for Sloane Street and indulging in some “leche-vitrine” (or window-licking as the French say), we started out with some breakfast at the Sloane Square brasserie Oriel. It’s the best place to have a quick cafe au lait and some scrambled eggs in that area. After breakfast, we walked up on Sloane Street stopping every few meters or so to admire the wonderful window displays of luxury goods. At the end of the street, we visited Harvey Nichols and went straight to the Foodmarket on the fifth floor for a few goodies and just to have a look at the wonderful packaging and presentation of the produce. Aside from the cafe, the bar and the restaurant, there is also a Yo!Sushi and a small counter from Daylesford Organic . We then headed back to Piccadilly for some more window shopping. 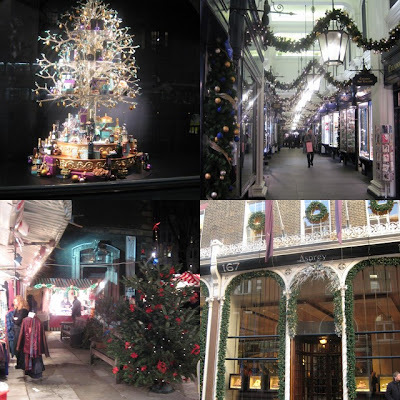 The windows of Fortnum & Mason were beautifully decorated and Burlington Arcade was filled with lit garlands and wreaths. We also stopped in the Christopher Wren-designed St. James Church to browse around the Christmas market where we bought a bronze stamp of a pirate ship for our son. We continued on to New Bond Street and Old Bond Street and saw the windows at Asprey, Tiffany & Co and Smythson. We ended up on Oxford Street and then to escape the hustle and bustle of Oxford street, we walked on South Molton street. We were on our way to meet good friends C and A with their kids at Carluccio’s. (One of their twins is my godson and I really wanted to meet him since the last time I saw him was when he was only a year old.) While we waited for them to arrive, I couldn’t resist to have a slice of chocolate fudge cake with some coffee. Carluccio’s deli was packed with lots of wonderful Italian delicacies and mountains of panettone in brightly-colored boxes. We had a few drinks with them then went to nearby Soho Japan for some fantastic Japanese food – sushi, sashimi, tempura and yakitori. We had a yummy dinner and lots of time to catch up. After dinner, we walked some more on Oxford Street to look at the lights and ended up at Hamleys where we all had a blast trying out toys and watching a really cool magic show. We said our goodbyes afterwards and organized to see them soon then we slowly walked back to Grosvenor Square.